Technical Car Experts Answers everything you need: front end wobble at higher speeds on yamaha xjr? front end wobble at higher speeds on yamaha xjr? The only time my bike developed a wobble was when the front and rear tyres were worn, after I replaced them with Roadsmarts the wobble disappeared. I wouldn't think that a wobble is a standard with the XJR if everything is as it should be but could be that it is a little fussy if something is not. Hi an update!!! after a new swinging arm and bearings,and new head stock bearing, new rear and front wheel bearings, no different , so sat with mechanic down listed all the things I had done? put it all back? still the same, mechanic said put your forks back to standard??? . So done that today!!! straight to 140, shut down, no WOBBLE . I only get a bit of wind buffering when I come up behind a car, but Its smooth, so going to speak to the man at Hagon and see if they can do me some rear shocks and front springs to match . Ohlins sold, Nitros ordered, can't wait. Good price too - £319.99 delivered - as opposed to £349.50 plus £30 postage from Hagon direct. Hagons have arrived, built to order, only took a week, highly recommended. Just need to fit them later and get out on it. - speak to Jim on 0560 103 7806 - about £60 less than going to Hagon direct, custom built to weight, special length, delivered in six working days. 15mm over - so 340mm as opposed to 325mm standard. 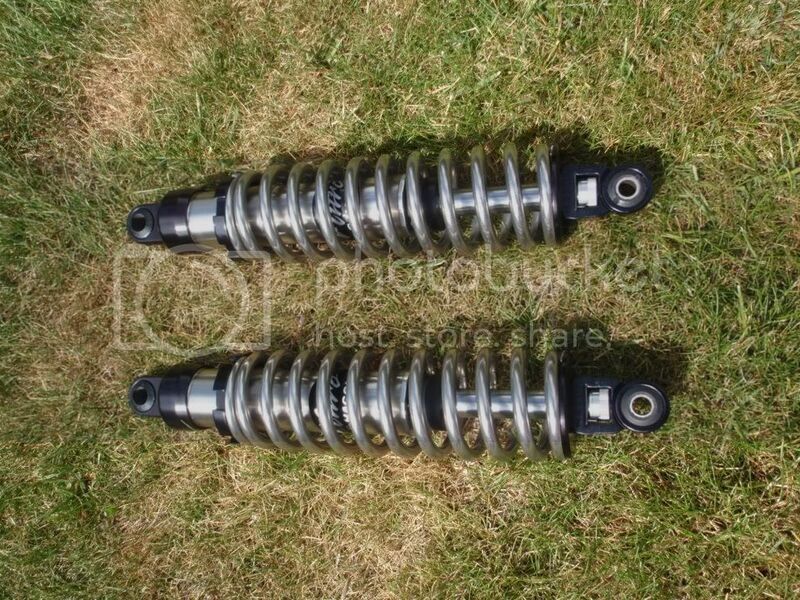 Was asked for my weight and whether I regularly take a pillion or luggage - the shocks came adjusted for that. Forks had been dropped but now in standard position. No screen at the moment. Note - both wheels on ground with centrestand, but side-stand is OK.
ME to my problem is still not occurred, hope all goes well through out my xjr. Labels: front end wobble at higher speeds on yamaha xjr?